While New Zealand is coping with the negatives being created by the Ardern coalition Government, the first quarter of this year has seen a significant mineral recovery in Australia, including several new IPOs, for gold and the range of battery metals. However, this was not reflected in the latest survey by the Australian Institute of Geoscience, which has several Kiwi members. 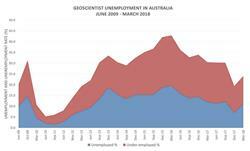 The AIG survey showed employment recovery amongst geoscientists has taken a step backward in the opening quarter of 2018 – cooling by more than 4% after a full year of improved employment outcomes over calendar 2017. Unemployment nationally among geoscientists increased from 7% at the end of December 2017 to 11.1% at the end of March 2018. Underemployment remained little changed at 12.9% at the end of March compared with 12.3% at the end of December 2017. More than 500 geoscientists responded in this latest survey. “The final quarter of 2017 marked the fourth successive quarter of employment growth, so the decrease in employment prospects during the first quarter of 2018 is disappointing, particularly for those who have been seeking work for more than a year,” Waltho said. He said the trend over the past 12 months, however, remains positive and “we hope that this setback proves to be due to seasonal factors, affecting mineral exploration in particular, and isn’t a sign that exploration and mining activity in Australia is again showing signs of cooling. Waltho said long-term unemployment remained a real concern, with almost 70% of jobless geoscientists being out of work for more than 12 months. Every State experienced an increase in both unemployment and underemployment in the March quarter. In the States with significant numbers of geoscientists seeking work, Western Australia had the lowest unemployment, followed by South Australia and Queensland. The highest level of unemployment was recorded in New South Wales and the ACT. Self-employed geoscientists generally fared similarly or better than those in company employment, except in South Australia.